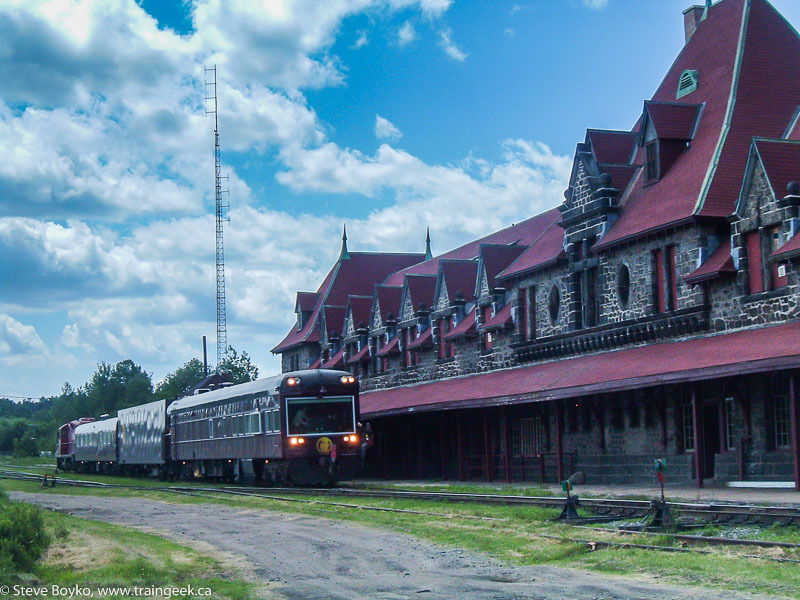 Don't forget about the upcoming charity excursion using NB Southern's business train. They are running from McAdam to Harvey and back, a different route than normal. They will depart McAdam at 13:00 and return by about 16:00. I assume the train will come up from Saint John in the morning. I won't be chasing it but I would appreciate any photos from those who do! I've been looking at digital SLR cameras for a while now. I've narrowed my choices down to the Olympus E-Volt E-500 and the Canon EOS Digital Rebel XT. Both are 8 megapixel SLRs, both fine cameras as far as I can see. I think the Canon body is slightly better in terms of capabilities, but the Olympus kit comes with two lenses instead of the one Canon lens. Decisions, decisions. I'm still accumulating the cash so it will be a while before I make the jump. I currently shoot with a point-and-shoot Fuji Finepix A210 and it is terrible for shooting moving objects (like, um, trains). The 1/2 to 3/4 second delay between pressing the shutter button and it actually taking a picture make it impossible to compose a good shot of a moving object. Does anyone have any recommendations on a digital SLR in the $800-$1100 range? Don't even both mentioning something like a Nikon D200 to me - it's way out of my price range. That CP 63 (the observation car) is one heavy car! 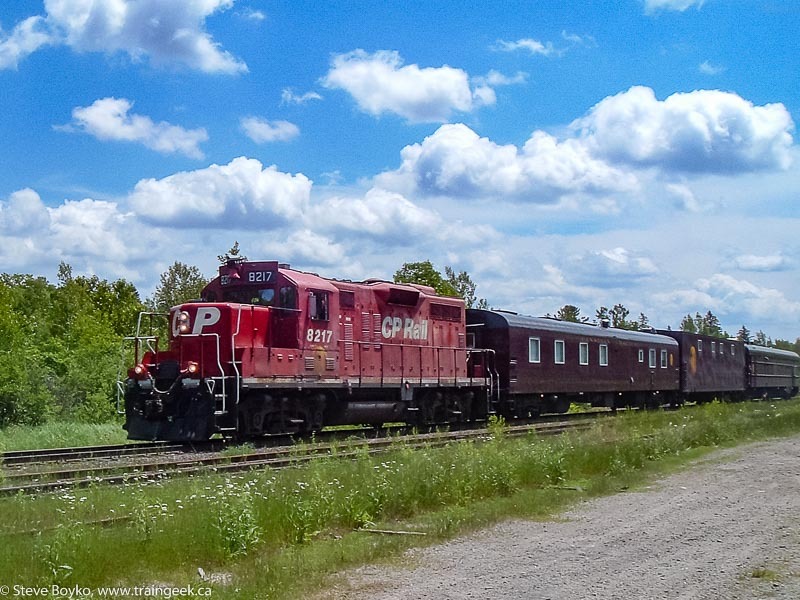 Here are some photos of CP 8217, the power for the CP TEC (track geometry) train that passed through New Brunswick this past week. 8217 is a GP9 built in 1954, with a 1750 horsepower engine. The engineer told me it was one of the most uncomfortable engines he's ever driven. The seat is not adjustable so it was pressing into the backs of his thighs and turning his legs numb. From the outside you could see the nose bouncing a little bit as the engine idled. It looks pretty normal inside. There's nothing to indicate it's pulling the TEC train except for some writing above the engineer's window. If you can't read it, the writing says "TEC: 60 MPH max, 35 testing, 25 reverse"
As I mentioned in my last post there was an eastbound freight waiting in McAdam for the CP track evaluation train to arrive. The crew from the CP train went over to the freight engines , and started shunting after the CP train went down the St. Stephen sub. They were using the beginning of the St. Stephen sub as their switching lead, because the yard tracks all had cars on them. The train had NBSR 2319, 9802 and 2318 with the crew in 2319. After they did a bit of switching there, they picked up a few boxcars. I thought it was neat that many of the MMA bulkhead flats still said CP Rail on them. The writing on the first photo says "1-800-WAH WAH". I don't know why! I spoke at length with the very friendly engineer. He was looking forward to going back home as he had been on duty since 0630. He told me that the track geometry train created three GBO's (track slow orders) for their return trip. I guess it doesn't take long for them to transmit their findings. They still had quite a bit of switching left to do before I left at 1530 for home. Their train had about 12-13 empty gypsum cars on it together with quite a few MM&A bulkhead flats. NBSR train 907-400, consisting of CP 8217, CP 68, CP 424993, and CP 63, made its westward trip from Saint John today. It left Saint John sometime in the mid-morning, passing through Fredericton Junction around noon. I arrived in Harvey at 12:30, after getting a little intelligence that the train would be arriving in McAdam around 14:00, meeting the eastbound freight there. I shot a few photos of NBSR 420306, some kind of MOW vehicle (a tie spiker? ), at rest in the third track at Harvey. I thought I'd scout around a bit and I found Shawn Duren waiting down by the ball park. We talked for a bit before I went back to the siding to wait for the train. The weather was sunny off and on, with nice puffy clouds, a nice change from the predicted thunderstorms. At 13:06 I heard the hotbox detector at mile 59.4 (Cork) go off, reporting 18 axles and no alarms. Incidentally, the detector reports "NBSR". I understand the detectors in Maine still report "CP". Right after that someone had a conversation with the RTC, and I realized it was the TEC train. The RTC said the freight was just clearing Vanceboro at that time. After a few minutes I heard the hum of engines and the train came around the bend at 13:15. It blew for the crossing and was gone, with the observation car's lights disappearing in the distance. I hopped in the car (already pointed the right way, of course) and raced for McAdam. I arrived well ahead of the train, and had a chance to chat with a friend of mine and wave hi to Shawn as he pulled in. Then I heard the train blowing for a crossing as it approached the yard. It pulled into view at 13:53 and slowly rolled through the yard. They went past the station on the north side, then backed up past the south side of the station to park by the crew shack on the St. Stephen subdivision. I couldn't resist the shot of a CP engine by the former CP station. The crew got out and the new crew got in. 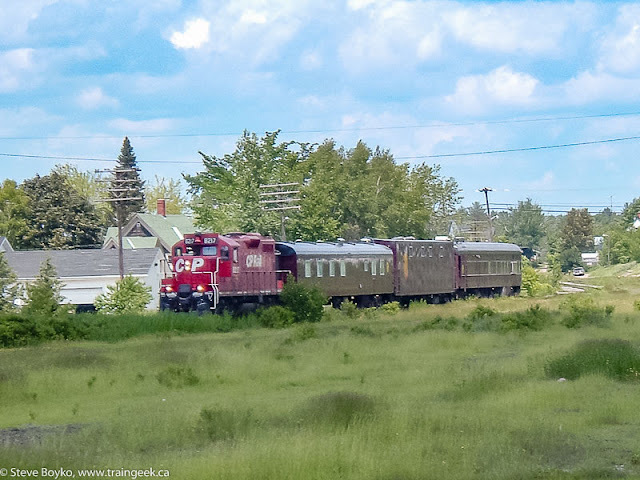 The crew from the CP train were going to take the freight back to Saint John, while the crew that brought the freight from Maine were taking the TEC train down to St. Stephen and back. Got it? :) Here's the crew that brought the train from Saint John, checking their notes before going to start shunting with the freight train. Wait - what's that on top of the bell? That's right - it's a camera. The crew told me that the CP crew in the trailing observation car have screens to show the front and rear cameras of the train at all times. Everything is taped for future reference. A big shout out to Jonathan and his friend who came out to see the train too. Keep on watching those trains. At 14:27 the train started rolling backward down the St. Stephen subdivision. CP 63 bravely led the way, in air-conditioned comfort. Here they are backing by the gypsum unloading point. I'll blog about the freight later. I haven't even looked at the video I took yet. I should give a shout out to teacher Jody who reads my blog - it was great to meet you! Dave Dineen photographed the CP inspection train at NB Southern's Dever Road Yard. It's a long distance shot but there is really no better shot available without trespassing. Thanks Dave! The CP train travelled from Brownville Junction to Saint John with NBSR 980x, 231x, 2318 and CP 8217 with three cars. It is currently in front of the NBSR shops at Dever Road. Unfortunately I was not able to view it but maybe someone will post some photos! My source tells me the CP TEC train will be coming through New Brunswick to Saint John TOMORROW (Saturday) after it is done its work on the MM&A. No time was given. The train will lay over all weekend in Saint John before working its way east on Tuesday as I previously said. I spoke with a reliable source yesterday and found some information on when the CP inspection train will be visiting New Brunswick. My source told me they will be working west from Saint John on Tuesday, scheduled to arrive in McAdam at 14:00. They will then work the St. Stephen Subdivision, returning to McAdam late at night. They will then proceed to Brownville Junction on Wednesday and presumably continue on to Montreal if they have no further work in Maine. My source did not know when they would make the eastbound trip to lay over in Saint John, but he assumed it was on the weekend. The CP track inspection train ("TEC train") may be on its way to New Brunswick. It was spotted in Farnham Quebec a couple of days ago and it was in Sherbrooke PQ last night, so it's probably on its way to the MM&A. Based on past years it will do the MM&A then do a quick trip up to Saint John and back, probably in 4 or 5 days. We'll see! 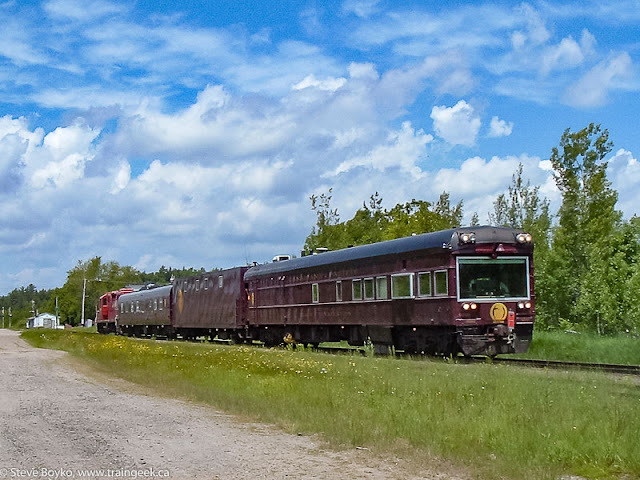 NB Southern is running another excursion, on July 1. They are running from McAdam to Harvey and back, a different route than normal. They will depart McAdam at 13:00 and return by about 16:00. If I were to chase it, I would get a shot departing McAdam, then get them across Harvey Lake. I'd take a few shots of the runaround at Harvey before going to Prince William Station for a straightaway shot and then back to McAdam. I'm assuming the eastbound freight will depart before them. I've uploaded scans of the Hopewell and Oxford subdivisions from the April 30, 1978 CN timetable to my web site, by request. The Hopewell Subdivision ran from Truro to Havre Boucher and the Oxford sub ran from Oxford Junction to Stellarton. Yesterday at approximate 11:30, VIA 14 (the Ocean) hit a truck near Adamsville, NB. The truck was empty and crossing the track to a peat moss factory. The photo on the Chronicle Herald web site shows how the train punched right through the trailer. Noone was injured. There was some fairly superficial damage on the lead unit and a few broken windows on an empty coach. The lead unit (6418) was set off at Birch Ridge and the trailing unit took the train to Moncton, where a CN unit was added to bring the train to Halifax, arriving at 20:05.